Imperial rounds are the traditional British rounds, shot at distances measured in yards. The “5-zone” scoring system dates back almost 200 years, being attributed to the then Prince Regent (later King George IV) – traditionalists still refer to “the Prince’s colours” and “the Prince’s reckoning”. Arrows in the gold score 9; reds score 7, blue 5; black 3; and white 1. Any misses (including arrows that hit the target but lie outside the scoring zones) are recorded as an “M”, and score zero. Metric rounds are those internationally recognized by World Archery (previously FITA), and are shot at distances measured in metres. 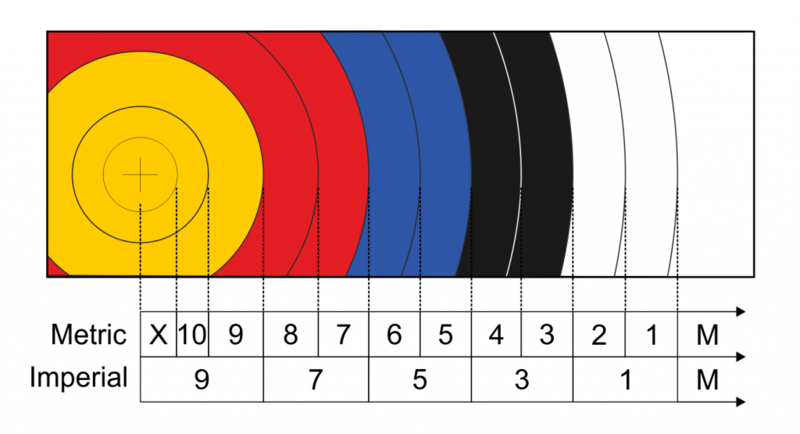 Like indoor rounds, they use “10-zone” scoring, where each colour is divided into an inner and an outer zone (for example, inner blue is 6, while outer blue is 5). Again, misses are “M”s. When you come to add things up, Xs score ten points, and (in case of ties) count as both 10s and Xs. Example: if your arrows were X – 10 – 8 – 7 – 4 – M you’ve scored 39, with five hits, two “10s” and one X. A word about “line cutters”: If an arrow shaft straddles two scoring zones, it scores the higher value. The dividing lines between the scoring zones are defined to be entirely within the higher one – so if an arrow as much as touches the line, it’s in. (If you can’t see any colour between the line and the arrow, that’s good enough. On a damaged or deformed target face, imagine where the line would be were it intact.) If the people on your target can’t agree, call the judge for a final ruling. Remember – if you touch an arrow, or the target face, before you’ve finished scoring, it scores the lower one.